The first significant Nike accident occurred at Fort Meade on the rainy afternoon of Thursday, 14 April 1955. At 12:35 p.m., Battery C was "practicing Nike procedures" when the rocket booster on an Ajax which was being elevated on its launcher suddenly ignited and the missile took off. Crewman Sgt. 1st Cl. Stanley C. Kozak, standing seven feet away, was caught in the flareback from booster ignition and suffered minor burns. What happened next has been interpreted in two very different ways. Typical of contemporary media coverage was the New York Times of 15 April, which reported the incident as page-one news. The Times cited Army sources as saying the Ajax "blew apart with a tremendous explosion over a sparsely settled area... about three miles away" from the launcher. "The ensuing shower of tortured steel caused neither casualties nor property damage, as far as the Army and police could determine early this evening." The newspaper reported the altitude as "not known." According to the Times, "An automatic detonator assured the explosion high in the air.... A ground explosion would have caused havoc near the heavily traveled new highway between Washington and Baltimore." The Army asserted that "[a]ssured explosions of the missiles in the air reduced the hazard to a minimum" and "the missile will not explode while it is in storage or emplaced on the ground." Military Police and Maryland State Police "rushed to the scene of what apparently was the first example of a new hazard of the pushbutton age." The area was "searched and a large number of fragments were collected; apparently the fins were the only whole parts that survived the blast. The fragments were much like the shrapnel [sic] of conventional artillery and even in free fall possibly could have caused injury or death." A board of Army officers and representatives of the Douglas Aircraft and Western Electric companies convened "to determine whether a crewman had accidentally flipped a switch or a malfunction of electronic equipment" had caused the launch. Perhaps reflecting public suspicion of Army honesty about Nike program safety, the Times emphasized that the Second Army commander had "ordered his subordinates to give all the facts just as soon as they were established." On 27 April, the Army announced the board was satisfied a shortcircuit had apparently caused the accidental launch. The Times reported a spokesman indicating "that the practice of firing procedure may also have contributed." This article clearly stated the missile exploded over the Baltimore-Washington Expressway. The Baltimore Morning Sun of 15 April 15 summarized the incident in much the same way as the Times, but treated it as local news. The Sun reported pieces of the missile landed on Barbersville and other fragments "too small to disrupt traffic" hit the Baltimore-Washington Expressway. Lt. Col. Dwight Bingham, Second Army deputy chief of information, was reported as saying "the Army was 'embarrassed' because it could not account for the incident." Bingham added that the Ajax carried an explosive warhead, "is believed to have exploded in the air," and "the rocket booster dropped off on the Meade reservation." Since no large pieces were recovered, he suggested the Nike had disintegrated. The Sun provided some interesting "local color:"
Barbersville residents who saw the material that fell, burned and then was carried away from the scene by the military described a loud explosion and said their houses shook. By the end of the military cleanup of the area near their homes, the only traces left of the missile's fall were two holes in the soft mud and a few bent and splintered small trees. One of the holes was about 4 feet in diameter and 2 ? feet deep. The other was narrower and deeper. Mrs. Bishop's observation appears to contradict repeated assertions that the missile "exploded somewhere several thousand feet in the air." It also confirms the recollection of a soldier who was there. Col. George O. Evans retired from the Army after twenty-six years service, mostly with Ajax and Hercules systems, his last troop assignment as commanding officer of 2d Battalion-44th Air Defense Artillery in the Republic of Korea. When he encountered the 1955 newspaper accounts on an Internet web site he contacted the webmaster with correct information because he "knew [the newspaper coverage was] not true." Colonel Evans had no personal knowledge of the incident but his first troop assignment was as Launcher Platoon Leader with an Ajax unit in Germany. ? There, in 1960, he met Chester Joswick, who as a warrant officer had been Battery C's Assistant Launcher Platoon Leader that rainy spring afternoon. Joswick related details of the incident to Evans and the two jointly developed a summary statement to "set the record straight." Details were further clarified in exchanges between Mr. Joswick and the author. Joswick noted that crew drill procedures were not fully refined in this early stage of the Nike program. Existing procedures required the booster squib cable be connected anytime a battery went to "Battle Stations" to track unknown aircraft. Battery C had gone to "Battle Stations" for drill purposes. The Launcher Section crew performed pre-launch checks, including one for stray voltage on the launcher. Except for the Section Chief (Sgt. Kozak) who remained above ground to assure the launcher was up and locked into position, the crew moved to the underground section room. As soon as the launcher came up the booster ignited and the Ajax left the launcher. Because no launch was intended the pin of the launcher's forward yoke support had not been removed. The yoke supported the missile on the launch rail in a near-vertical position. When the missile was fired, the yoke support hinged down and away as soon as there was any forward or upward movement, allowing the missile to clear the rail. As the pin had not been removed the yoke remained in place when the Ajax took off, tearing out the No. 3 Tunnel or fairing strip covering essential wiring on the missile's side. This damage rendered the missile warheads inoperative and prevented an explosion. It is also likely the warheads failed to detonate because the missile never attained the g-forces necessary to close the arming mechanisms. Because the launcher had not fully erected, the Ajax left at an angle rather than nearly vertically as designed. Mr. Joswick recalls the missile flew to a height of about 3000 feet before it broke up. Structural damage sustained when the Ajax left the launcher rail, coupled with rapid initial acceleration, rendered the missile aerodynamically unsound and led to the break up. The fact the crew had not removed the propulsion safety pin during the drill contributed to the failure of the sustainer motor to start. And, since the launch was unintended, the missile was not under radar control. Neither the missile nor the booster exploded in flight. The booster separated and fell onto Barber's Trailer Court more than a mile from the launch site. Fuel tank fragments fell on the Baltimore-Washington Expressway where the fuel and oxidizer caused a fire but little or no damage. The missile nose section was found 500 yards from the launcher with the guidance assembly still attached. Regarding the cause of the accidental launch, Mr. Joswick recalls that at the outset of the investigation the Battery Control Officer, Launching Control Officer and Section Panel Operator all "denied even touching the switch to activate the missile." The board of inquiry isolated the cause as an electrical short caused by rain water in the junction box on the outside rear of the launcher control trailer. This condition defeated the crew's pre-launch safety checks. Notwithstanding this fact, the battalion commander was relieved of his duties. The accidental launch was not the first mishap to befall Fort Meade's missiles. The official Ajax program history notes that "NIKE Battery No. 5 located at Ft. Meade, Maryland, became ignited during a lightning storm an May 3, 1954. Three van trailers were "...completely consumed by fire...." Mr. Joswick visited the site the day after the fire and found only "a semimolten mass of metal." This incident led to a procedural change requiring that lighting rods or masts be placed beside each van. Battery C left Fort Meade in the summer of 1956. The men and equipment were redeployed to activate a new site near Derwood, numbered W-93 and alternately referred to as Laytonsville. At W-93 the men cadred a new Ajax unit designated Battery B-514th AAA Missile Battalion. Simultaneously, the old designation "Battery C-36th AAA Missile Battalion" was transferred to the Ajax unit at Fort Smallwood--also known as Pasadena or Jacobsville and numbered BA-43. B. R. (Bud) Blaydes was part of the original group of soldiers which activated BA-43 in early spring 1956. His unit was initially designated Battery B-602d AAA Missile Battalion and moved to Fort Smallwood from the Army Chemical Center at Edgewood Arsenal. Blaydes recalls that when the redesignation came in early summer 1956 "there was much, much complaining as we did not wish to be burdened with the stigma that came with their goof ups." Any "stigma" associated with the designation was short lived. On 1 September 1958, in another of the seemingly endless Army-wide reorganizations of artillery units, the 36th AAA Missile Battalion was officially redesignated 1st Missile Battalion-562d Artillery. The 514th was redesignated as 4th Missile Battalion-5th Artillery the same date. When the Regular Army converted to Nike-Hercules it reduced the number of Ajax sites by closing some and transferring others to the Army National Guard. 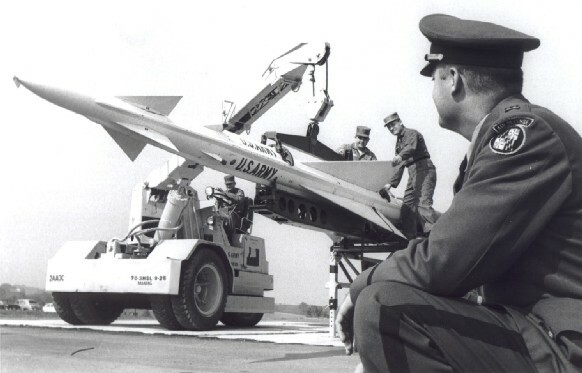 BA-43 was transferred to Battery A-1st Missile Battalion-70th Artillery, Maryland Army National Guard, on 1 March 1960. The site was deactivated in December 1962 and is now used by the Anne Arundel County Board of Education. W-93 at Derwood was inactivated in the summer of 1960. As embarrassing as the Fort Meade "rogue Nike" incident had been for the Army it at least attracted only short lived public attention. A far greater disaster, the worst of the Nike program, occurred about 1:15 p.m. on 22 May 1958 at Site NY-53 near Middletown, New Jersey. Eight Ajax missiles exploded, killing ten men and injuring three others, while civilian ordnance personnel and soldiers were installing new arming mechanisms. Although no residents of nearby towns were injured, the New York Times noted the disaster "came a few hours after the Army had announced it was converting the [Middletown] base... and eight other Nike installations in Northern New Jersey from Ajax to Hercules missiles." Not surprisingly, this exacerbated existing citizen fears because the technologically superior Hercules would usually carry a nuclear rather than a conventional high explosive warhead. The Middletown incident coupled with existing widespread community hostility proved a public relations nightmare for the Army. Conversion plans were later scrapped and NY-53 was transferred to the New Jersey Army National Guard, which operated it from 1960 until it was deactivated in 1964. The Fort Meade and Middletown incidents occurred early in the Nike program and were by far the most serious at any of the Nike missile sites. They led to development and implementation of procedures which assured safe operation of both Ajax and Hercules systems until the last sites in the United States were deactivated during 1974.